"The easy to make drink is hard to put down. 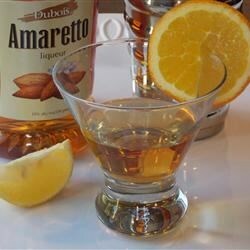 A little sweet and a little tart, the amaretto sour is a simply delicious cocktail." Combine amaretto and lemon juice in a cocktail shaker. Add ice and shake until chilled. Strain into chilled sour glass. Thought it was good. The bad thing is that there will always be someone saying this isn't a "proper" one... who cares? If it's good, it's good. No sugar syrup, no egg white, no cherry garnish - this is not a proper amaretto sour! Sorry, this is terrible! Nothing like an Amaretto sour, I hate that I wasted Lemon juice and Amarreto on this! Definitely need to use real sour mix for this cocktail. Delicious and simple. Just what I needed.